Do you love to play Family Feud? 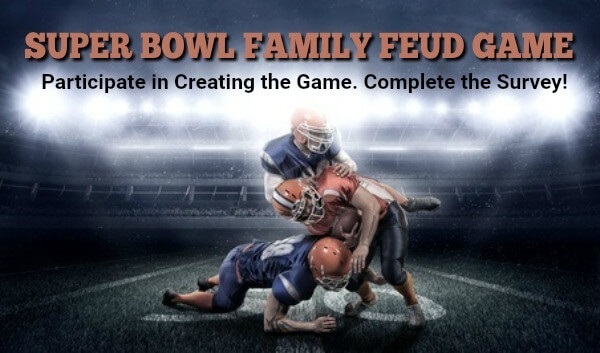 If so, why not help us create an Super Bowl Family Feud version of the game by answering some questions related to the Super Bowl. Fill in each space in the form below as quickly as possible. It is important that you type in the first answer that pops into your head. Do not research answers. Also, do not spend too much time thinking about your responses (no more than 5 seconds per answer). If you cannot think of a perfect answer, type in the first thing that comes to mind. Once complete, please do not go back over your answers. It is essential that your answers be spontaneous. That is how the game works and that is what makes the responses so unpredictable and fun. 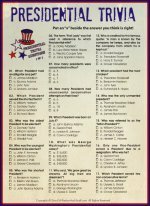 When we have received 100 responses we will post the results here so that you can use them for your new years parties. PLEASE NOTE: Although there is a space provided for your email address below, it is optional. It is your choice whether or not you want to provide it. All of the other spaces need to be completed, in order for you to be able to submit the form. If you would like to be notified of future surveys you will need to provide an email address. Have fun and thanks in advance for participating.